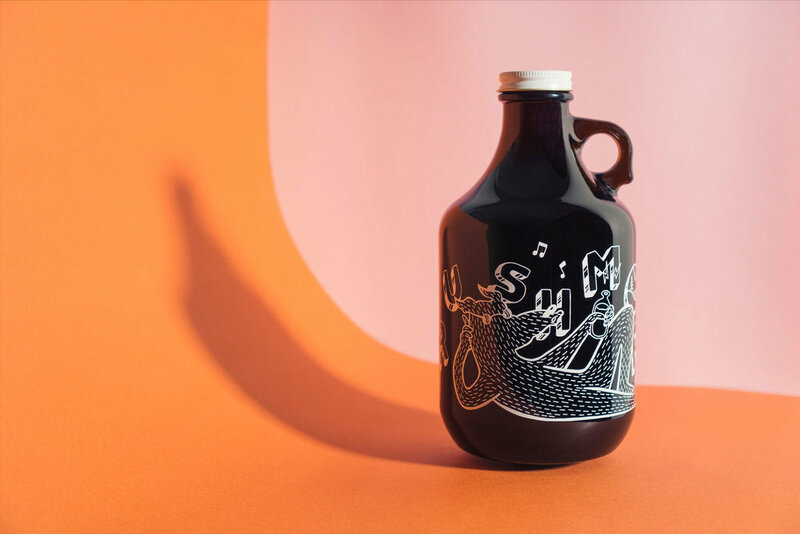 In celebration of our two year anniversary, we have collaborated with Melbourne-based illustrator WILEYKEIKO to create a unique collectable growler of our classic cold brew concentrate. Each bottle has been hand screen-printed in our Melbourne facility and comes with its own numbered card. Only 300 bottles made. Rushmore Coffee is a small batch cold brew coffee, wholeheartedly crafted in Melbourne, Australia. Our coffee is brewed, filtered and individually bottled by hand in packaging which is screen-printed in house. This allows us to ensure the utmost quality across all aspects of our production. The Rushmore brew is perfectly crafted to enjoy hot or cold. Served hot, it is a delicious smooth coffee to warm you up, invigorate the senses and kick start the day. Served cold, it is a refreshing beverage to sip in the sunshine. Rushmore can also be use in cocktails, baking and cooking. You can enjoy a Rushmore cold brew wherever you are, any time of day. Our concentrate coffee can be kept at home in the fridge or brought along to work as a convenient and delicious pick-me-up. The ready-to-drink cold brew is the perfect energiser to take with you wherever you go. No mess, no stress! Rushmore is incredibly smooth thanks to our cold brewing process which leaves any sour notes out of the equation. We specially select medium roasted single origin beans for the best balance between roast depth and its natural delicate flavour. A coffee kick without the bitter punch. We carefully consider all aspects of our brewing process right down to the thoughtful disposal of our coffee grounds. We offer our grounds back to the community of local horticulture and permaculture groups, allowing this great resource to provide further benefits to local greenery an food production. We love offering our cold brew on tap with our two unique Rushmore Coffee carts. Serving our nitro cold brew, classic cold brew, specialty batch-brewed filter coffee and iced teas or homemade lemonades for the kids - Rushmore is happy to meet the needs of your market or event. With no power required to run our carts and serve our brew, Rushmore will be an easy addition to your next market or event. Whether it's free coffee for the office or specialty coffee to compliment an event, Rushmore would love to be part of your next meeting, corporate event or conference. Serving specialty batch-brew filter coffee, our famous nitro cold brew, classic cold brew and iced teas to order we will be dedicated to reach your high-standards and allow your team and/or clients to relax and network. Our team is dedicated to serving the highest quality specialty coffee to enhance the experience of your event. Whatever the size or budget of your event, we're happy to cater to your needs. Serving our famous nitro "draught-style" cold brew, our classic cold brew and batch-brewed filter coffee - Rushmore will meet the needs of your event. Connect with us on social media to find out the latest news, promos and locations of our pop-up events. © 2015-2018 rushmore goods pty ltd.